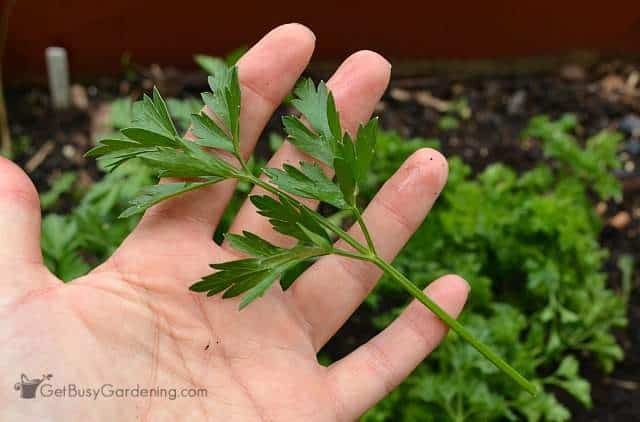 Parsley is an easy to grow, cold hardy herb that can be harvested throughout the entire growing season. It’s a biannual plant, which means it will grow for two years, and it will flower and die the second year. Once parsley flowers, it won’t taste as good so it’s best to harvest the entire plant when it starts to flower. Harvesting parsley, and then cleaning and storing it allows us to enjoy our homegrown parsley all year long. Like basil, parsley is a cut-and-come again plant, meaning you don’t have to harvest it all at once. You can harvest from it over and over again throughout the entire growing season. So any time a recipe calls for fresh parsley, you can simply walk out to the garden and take the exact amount you need from the plant. 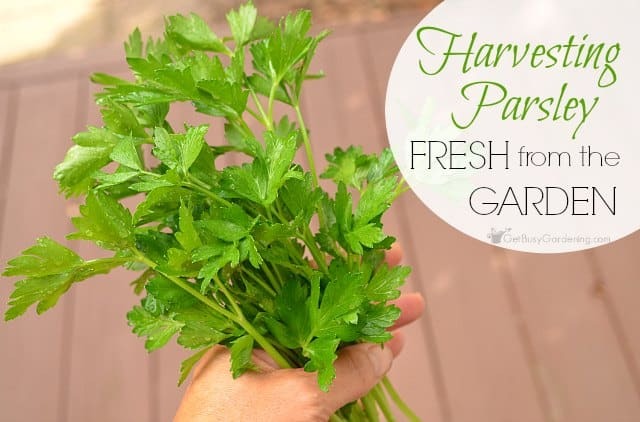 Harvesting parsley fresh from the garden is easy. To harvest parsley, simply cut or pinch off each sprig at the base of the plant (right at the soil level). This will allow the plant to branch out again, and produce even more fresh parsley for you to harvest later. 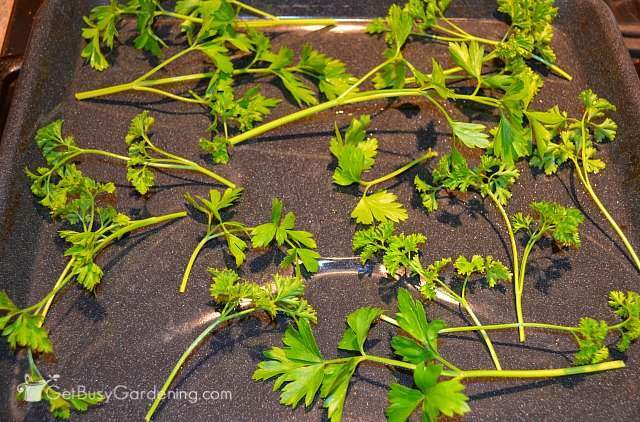 If you’re going to harvest all of your parsley at once, you can simply cut the entire plant down to the ground. Select only the stems that have dark green leaves on them, and discard any yellowing or brown stems. Since parsley grows pretty low to the ground, sometimes it can be pretty dirty after you harvest it. If there’s not much dirt on the stems and leaves, you can just give your parsley a quick rinse. But if there’s a lot of dirt, then I like to toss my parsley into a bowl of water and let it soak for a few minutes. Then I’ll gently swish it around to wash the dirt off. After that, I drain the water using a colander, then fill the bowl and swish it around again. I’ll repeat this process until the water is clear. 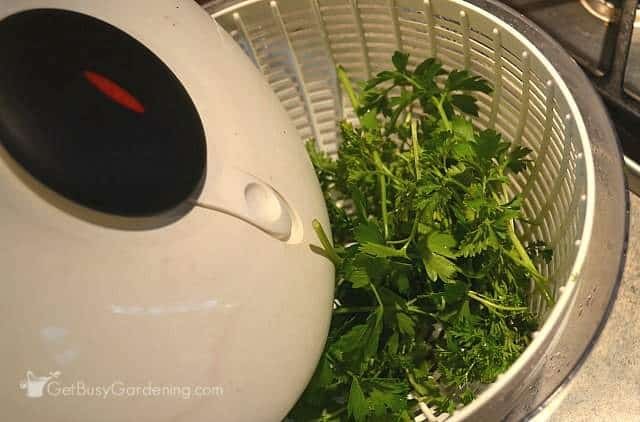 Once it’s clean, I use my salad spinner to spin dry my parsley before storing it. It’s a fantastic (and essential) tool if you grow herbs or any greens in your garden! In the fridge: Fresh parsley will last for several days in the fridge, and sometimes I’ll just store it right in my salad spinner. An herb keeper also works great for storing fresh parsley, and it takes up less room in the fridge. 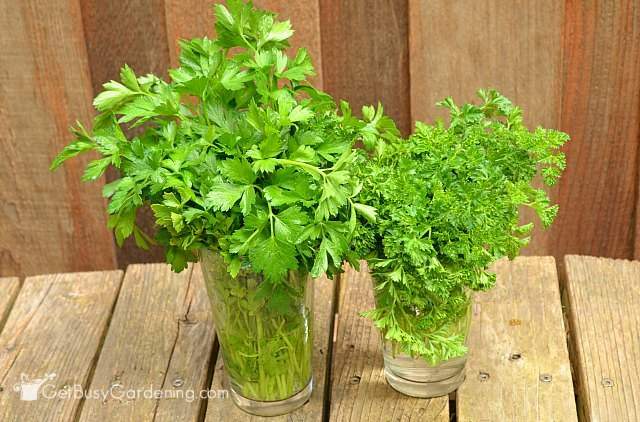 You could also store fresh parsley in a glass of water in the fridge for a few days if you’re in a pinch. In the freezer: Freezing parsley is easy, and it’s one of the best ways to store garden fresh parsley. I just toss my fresh parsley into a freezer bag. 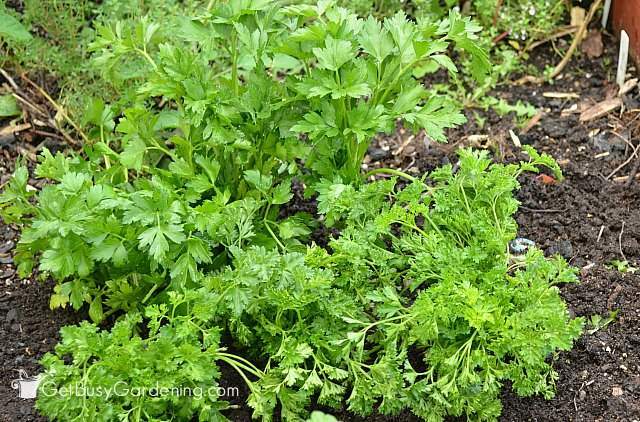 But if the parsley isn’t dry enough, the leaves can clump together in large chunks using this method. So, if you don’t want that to happen, you can flash freeze your parsley first. Simply lay the parsley sprigs on a cookie sheet and freeze them for 10-20 minutes before putting them into a storage container. That will keep them from sticking together once they’re frozen. I have a few favorite recipes that call for parsley, so I also like to freeze some of my parsley in perfect portions to make it super easy to just drop it into my recipes. To do this, you can use herb freezer trays or mini ice cube trays and measure out any portion you want before freezing. In the pantry: Another way to preserve parsley is by drying it using a dehydrator or herb drying rack. Once it’s dry, you can store it whole in a sealed container, or you can crush it up and store it in a spice jar. A mini food processor or an herb grinder makes crushing parsley super quick and easy. Parsley is one of those herbs that you probably don’t need every day, but it’s definitely a must to always have it on hand in the kitchen. 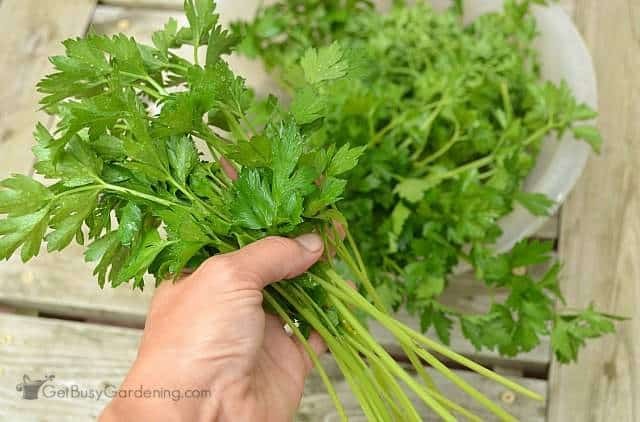 Nothing beats the flavor of fresh parsley, but since it’s super easy to store, you can keep your garden fresh harvest and use it all winter long. 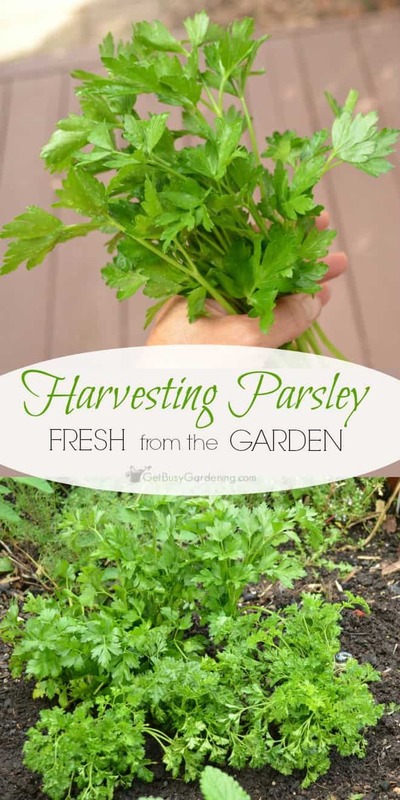 Do you have any tips for harvesting parsley and storing it for later use? Please share them in them comments section below! I agree, nothing does beat fresh parsley, especially on potatoes. I spend about 99% of my life in the kitchen cooking (I love to eat) and find myself using parsley a lot. For the first time, I used it on a roast that I made in a Dutch Oven stove top. It added just the right flavor!!! I was so pleased. I did add the last 30 seconds of cooking though so that would be my tip. Nice, thanks so much for sharing your cooking tips! These sound delicious! Just what I’ve been looking for! I plan to start a herb garden soon. This will help a lot! Awesome! Hope it grows great for you! Great advice! Thanks for sharing with the Delicious Dishes Recipe party! 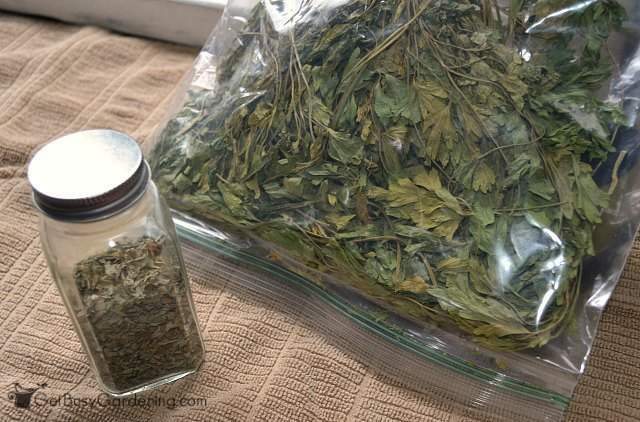 In your picture of bag of dried basil. It is the full stem/leaves. Can you just crush the stem/leaves for recipe or do you have to pick off the leaves?